A team of five Ph.D. and M.S. graduate students from University of Houston’s Department of Earth and Atmospheric Sciences won first place in the Imperial Barrel Award Program (IBA) of the American Association of Petroleum Geologists (AAPG) Gulf Coast Section competition. The UH team competed on March 17 at the Anadarko building in The Woodlands. 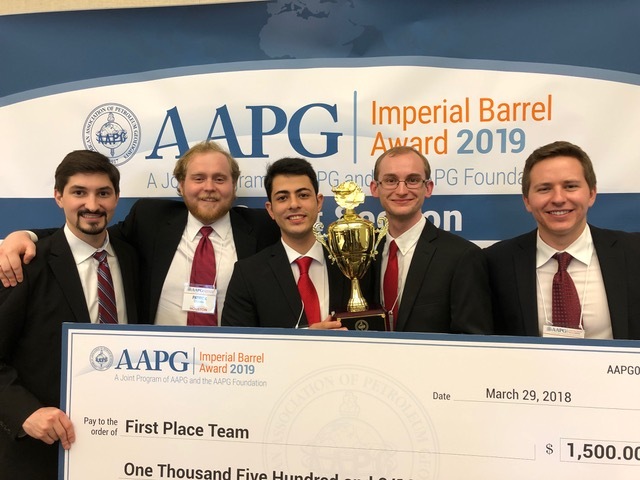 They will advance to a final, global competition held at the Annual AAPG Convention in San Antonio on Saturday, May 18. The global competition includes the all first place teams from the sectional competitions. The second place award went to The University of Texas at Austin, and the third place award went to Auburn University.